12TH INTERNATIONAL CONFERENCE ON REACTIVE OXYGEN AND NITROGEN SPECIES IN PLANTS: FROM MODEL SYSTEMS A great forum for discussion and for the effective exchange of information and ideas on every aspect regarding reactive oxygen and nitrogen species metabolism, action and signaling in plants. The Plant Oxygen Group (POG) Conference, supported by the Society for Free Radical Research (SFRR-Europe), is a great forum for discussion and for the effective exchange of information and ideas on every aspect regarding reactive oxygen and nitrogen species metabolism, action and signaling in plants. The Conference aims also to provide a dynamic interface between academic research and field applications, and represents an important opportunity for everyone in the field, especially promoting early career scientist participation. The scientific program will include several oral communications by young promising scientists - selected from abstracts- next to lectures by top scientists, facilitating discussion among participants in a friendly and stimulating environment. The 2015 POG Conference has already received the Patronage of EXPO Milano 2015, the Universal Exposition on Feeding the Planet, Energy for Life. This underlines the pivotal role of research and scientific innovation in these fields for facing most urgent and current challenges, such as the world increasing demand for food and energy or climate change effects on crops and biodiversity. The POG Conference will be organized by the University of Verona and by the University “Campus Bio-Medico di Roma”. University of Verona was first instituted in 1982. Today this University includes 15 Departments which operates in different fields and host about 23000 students. The University “Campus Bio-Medico di Roma” is a private academic institution established in 1992 hosting more than 40 multidisciplinary research units devoted both to education, advanced research and provision of high-quality healthcare services. On-site Registration desk will open on Tuesday June 23rd at 15.00. The Conference will include a Pre-Conference Welcome Cocktail on Tuesday 23rd evening and a Social Dinner on Wednesday 24th evening. Works will start at 9.00 on Wednesday June 24th and will end on Friday June 26th in the afternoon. More detailed information concerning the Conference, scientific and social programs, registration, accommodation, abstract and poster preparation will be included in the second announcement and in the final program. COGEST M. & C. has been established since 1985 in Verona as a result of the fusion of different experiences in the field of Services and Communication. 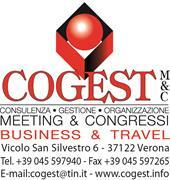 COGEST M. & C. is certified ISO 9001, it is member of Verona Tuttintorno, Verona Convention Bureau, Federcongressi, Associazione Industriali Verona. contacts with: catering from 10 up to 10.000 person with the possibility to study specific menu for each events. The experience gained by COGEST founder partners in a multinational of direct selling enables our staff to organise meetings and congresses for commercial and industrial firms with excellent results from all points of view. The main aim of these meetings is often the incentive and the stimulation of sellers and customers. The final result is always achieved, as demonstrated by the constantly renewed confidence of the acquired customers in this field. We arranged the memorable FICC (Federation Internationale de Campign et de Caravanning) meeting held in the Parco Nord in Bologna. With the partnership of Bologna Fiere and the participation of more than 1000 caravaners from all over the world, we provided electricity outlets, bars, entartainment, security and all the little things to make the 2500 participant’s stay unforgettable. We have our own Graphic department for all events we organise. Within 24 hours we are able to give suggested graphics to our costumers. We also have a medium sized printing press with which we print congress programmes, menus and posters. For larger scale printing we work closely with a reputable printing company here in Verona to deliver a professional medium to satisfy your request. Thanks to our graphic department we are able to design and print banners and posters. With the customers approval we always attempt to use recycled paper.